Ping Cheng High School’s Lin Ching-kai, left, prepares to throw to first base in their Mazda Taiwan-Japan U18 Baseball Elite Invitational game against the Nara Prefecture All-Star Team in Taichung yesterday. Following the success of inaugural MAZDA " TAIWAN/JAPAN H.S EXCHANGE SERIES" in Taipei in December 2015, the 2nd Exchange Series started at Taichung Stadium in Taichung on X’mas eve, Saturday December 24, 2016. (by Taipei Times) Taoyuan’s Ping Cheng High School prevailed 7-5 over the Nara Prefecture All-Star Team, which is composed mainly of players from Chiben Gakuen High School, in the opener for the Mazda Taiwan-Japan U18 Baseball Elite Invitational. 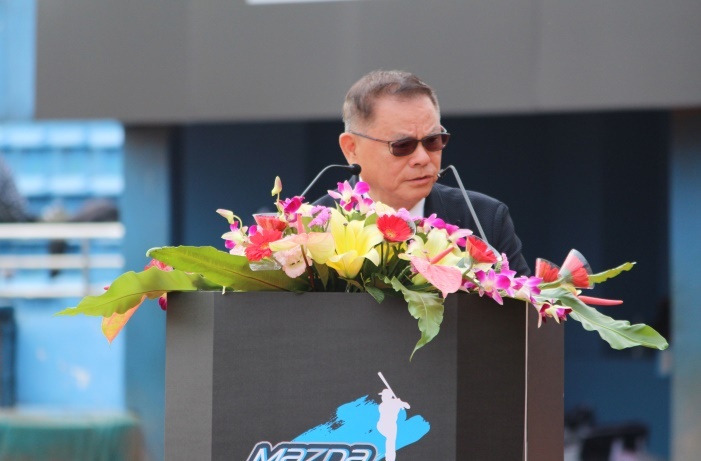 At the opening ceremony, Tom Peng, President of Baseball Federation of Asia thanked MAZDA for their strong support not only to this event but development of baseball among young athletes in Taiwan and this Exchange Series help promote international friendship. Taichung Agricultural Senior High School, who finished second in Taiwan’s Black Leopard Banner competition, to take on Riseisha High School from Osaka, Japan, champions of the Meiji Jingu Baseball Tournament in Tokyo on Sunday, December 25.